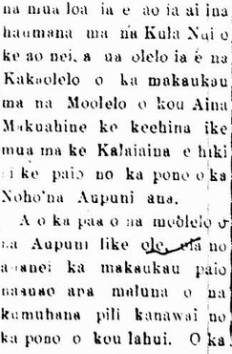 moʻolelo: n. Story, tale, myth, history, tradition, literature, legend, journal, log, fable, essay, chronicle, record, article. ʻāina: An eating; the means of eating; Land generally; a farm; a field; a country; an island. Before the sugar plantations, before the cattle ranches, before the eucalyptus groves, there was (and still is) Hāmākua, an ʻāina rich is history and tradition. 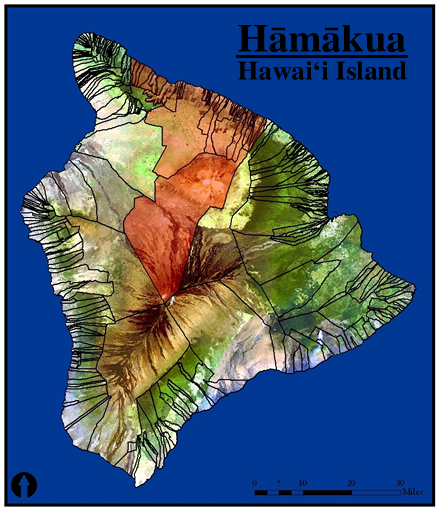 Learn more about the moʻolelo of our ʻāina by clicking on Hāmākua in the map to the right! Find moʻolelo, mele, ʻōlelo noʻeau, and photos from each of the ʻāina listed below by clicking on the links or by following the maps. Learn more about the steep trails that our hui is currently traveling upon. Hawaiʻi Island Ahupuaʻa Map. By N. Peralto. (c) 2012. 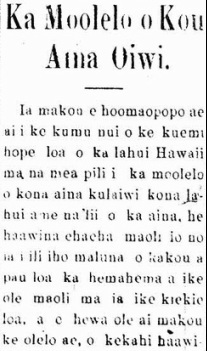 Why our kūpuna thought it was important to know the moʻolelo of our ʻāina, and why we must continue to pass on these moʻolelo today! 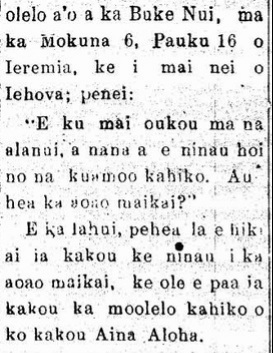 The following is an excerpt from an article written in Ka Nai Aupuni on January 17, 1906 by Joseph Mokuohai Poepoe. As the editor of the newspaper, Poepoe was also one of the most prolific ʻŌiwi scholars and authors of the early 20th century. Read his thoughts about the importance of knowing the moʻolelo of your ʻāina ʻōiwi in the article below! As we are looking to understand the reason for the decline of the Hawaiian nation in respect to [the knowledge of] the moʻolelo of their ʻāina kulāiwi, their nation, and the aliʻi of the ʻāina, it is truly a painful lesson that has been inherited by all of us, [that is] the incomplete and lack of knowing this kind of knowledge of great prominence. And, so that we are not incorrect in our words, this is another primary lesson that should be taught to the students in the universities of this time; it has been said by the orators of old, that the knowledge of the moʻolelo of your motherland is the primary position of knowledge upon which a firm political stance can be made so that [we] may fight for the pono of our governance.